I really, really like going to the hardware store. My favorite section is definitely the paint section. I tend to consider the style of my home as “minimalist but comfy contemporary”. Which basically means that I don’t have a ton of decor out on shelves and hanging on the walls. I’ve said it once before and I’ll say it again, who wants to dust all of that stuff? I give all of my walls a nice pop of color to compensate. There probably isn’t a color that a room in this house hasn’t been at least once. But whenever I get to go to the hardware store to accompany someone who will be doing actual work i.e. repairing the water heater, replacing rotten wood on the exterior, repairing a monstrously huge hole in my bedroom ceiling… I like to wander. Up the aisles and down the aisles I see things and try to figure up uses for them. Do I really know what that little metal cup thing is for? Heck no! Can I figure out something that the manufacturer didn’t intend for it? Quite possibly! On one of these trips I had to hang out near the cart, because Russell gets terribly upset if I try to wander. The place I was stuck in happened to be right beside the chain. They had chain that was meant for hanging lighting fixtures, crowd control and a bunch of others. I flagged a fella’ down who made my cuts without judging that I was getting a bunch of styles in one and two foot increments. Soon, this bracelet was born! You may want to know exactly what this type of chain is called and the sad truth is that I don’t have a clue. The links look like a figure 8 where one side as been turned to face upward. 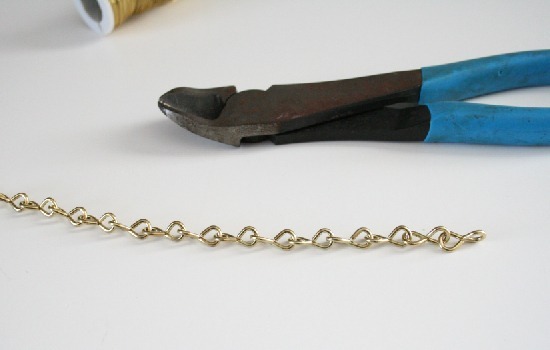 Take your chain and wrap it around your wrist. 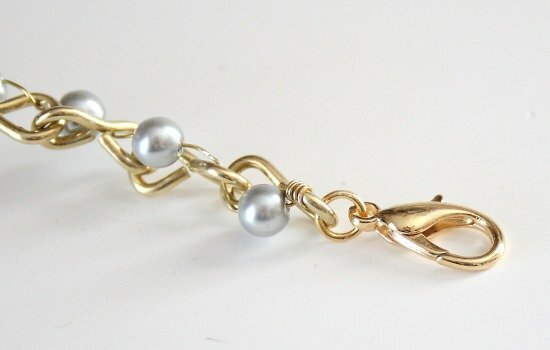 Remember that you’ll have your lobster clasp plus jump rings that will make your bracelet longer in the end. For me, 15 links was perfect. 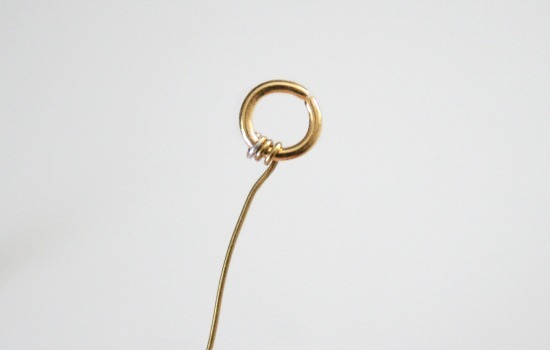 Take your first jump ring and wrap the wire around several times. If you feel more comfortable, you can add a dab of glue, like E-6000, to make sure it doesn’t go anywhere. Thread the wire through the first of your links until the jump ring catches. 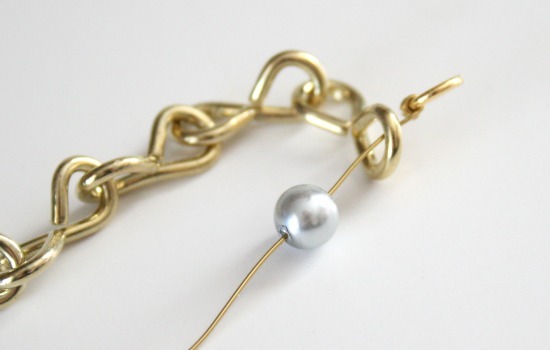 Thread your first bead onto the wire and push so that it kind of nests into the first loop on the first chain. 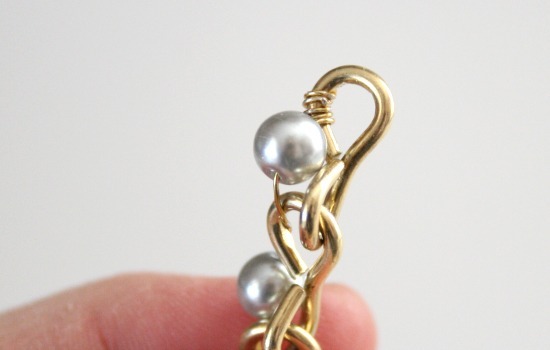 Take the wire and while holding the pearl in place, loop through the second portion of the first link. 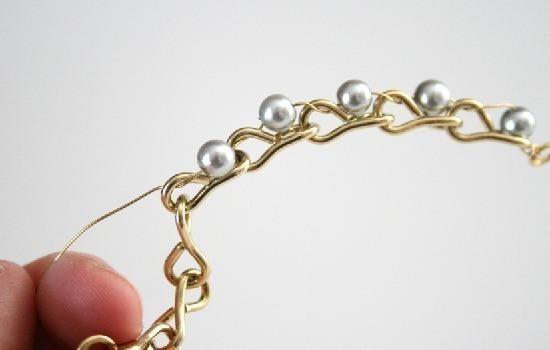 Push up through the second link, thread on a pearl, make sure it is secure, thread the wire through the second half of the chain. Continue to repeat for the entire length of the chain. 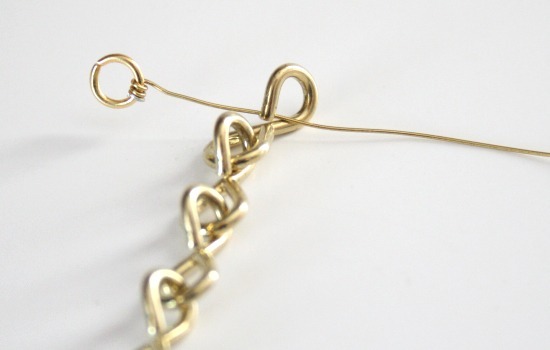 When you reach the end, wrap the end of your wire around the final link until secure. Add a dab of glue if you would like. Attach a jump ring and a lobster clasp the the end to finish up. 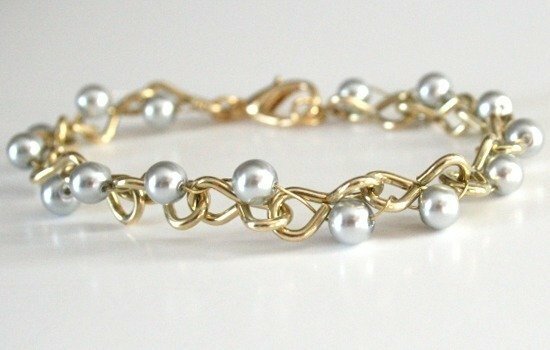 I’m working on another bracelet using hardware store chain to accompany this fun piece. Be sure to check back when I post it next week! What a great project! Can't wait to go to Home Depot! Love this bracelet. 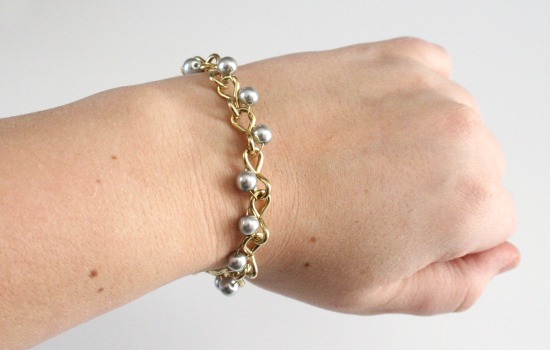 Did you ever make the other hardware chain bracelet you refer to? I checked your blog and did not find it. Thanks. Nicely done! I need to spend more time in the hardware store! Would this be too heavy to make a necklace to match? 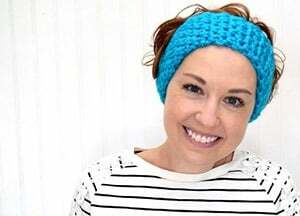 This would be a great project for my granddaughters. It’s actually not heavy at all so I’d say go for necklaces!